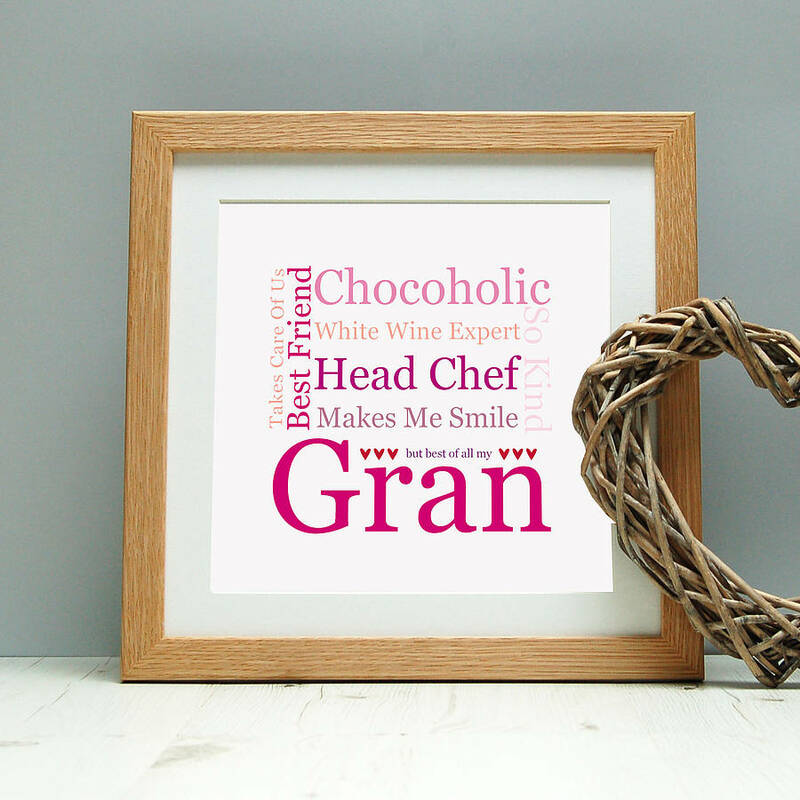 A unique personalised printed gift for a special Grandmother. 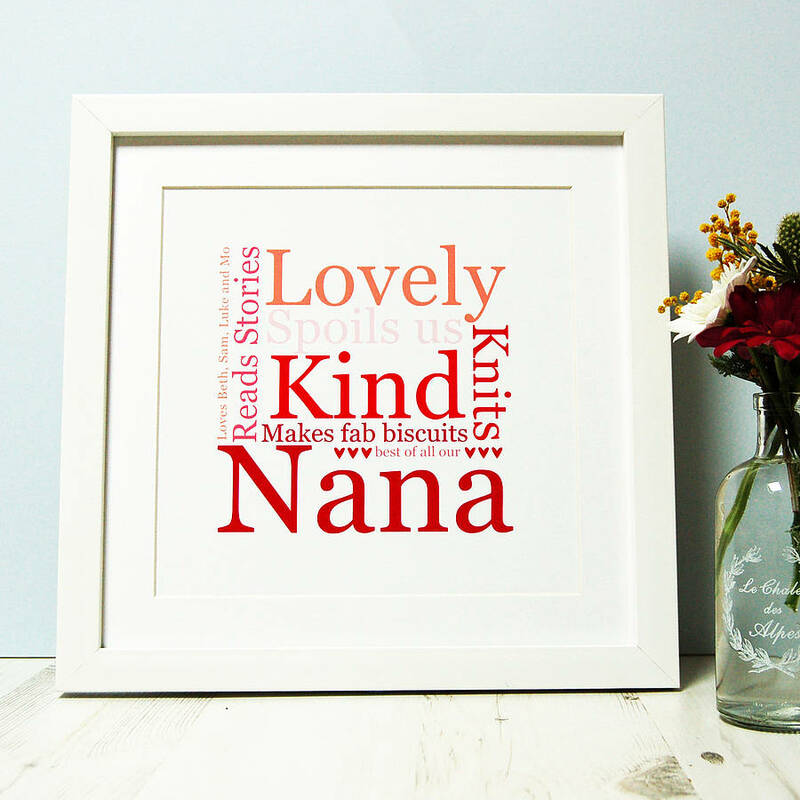 Choose from Gran, Nana, Grandma, Nanny or Nanna. Great Christmas gift. 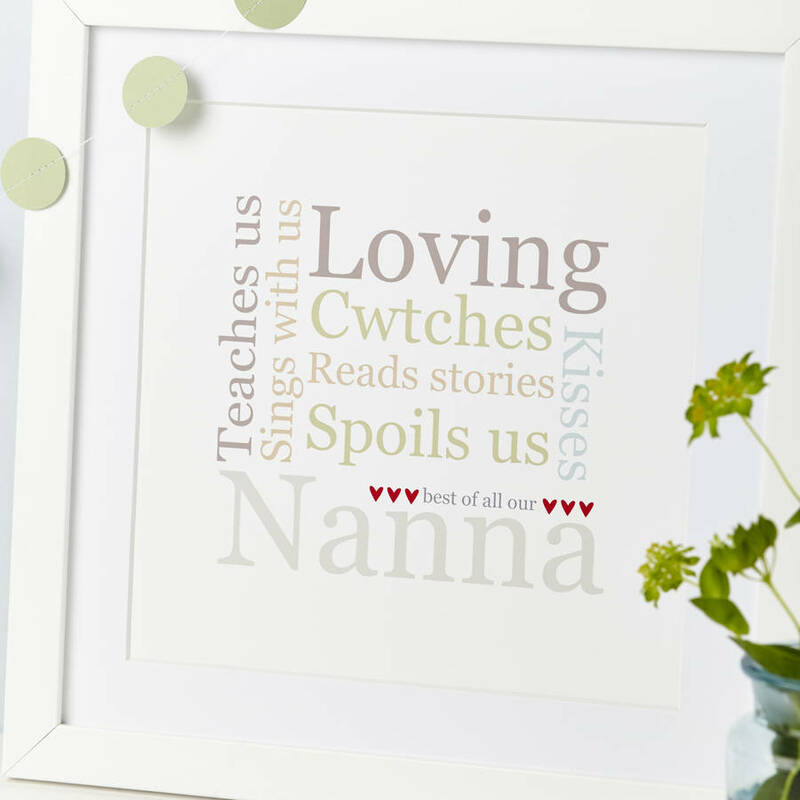 An original gift personalised to your Grandmother that can be treasured. 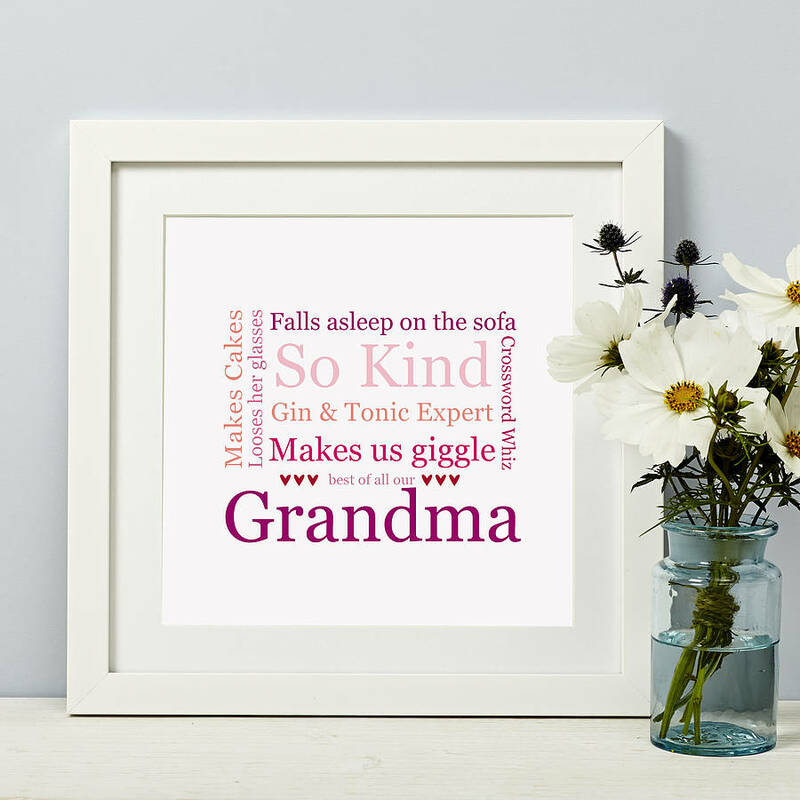 A lovely memento of a special occasion, birthday, Mother's Day, New Gran, or just because you want to let your Grandma know she's special. 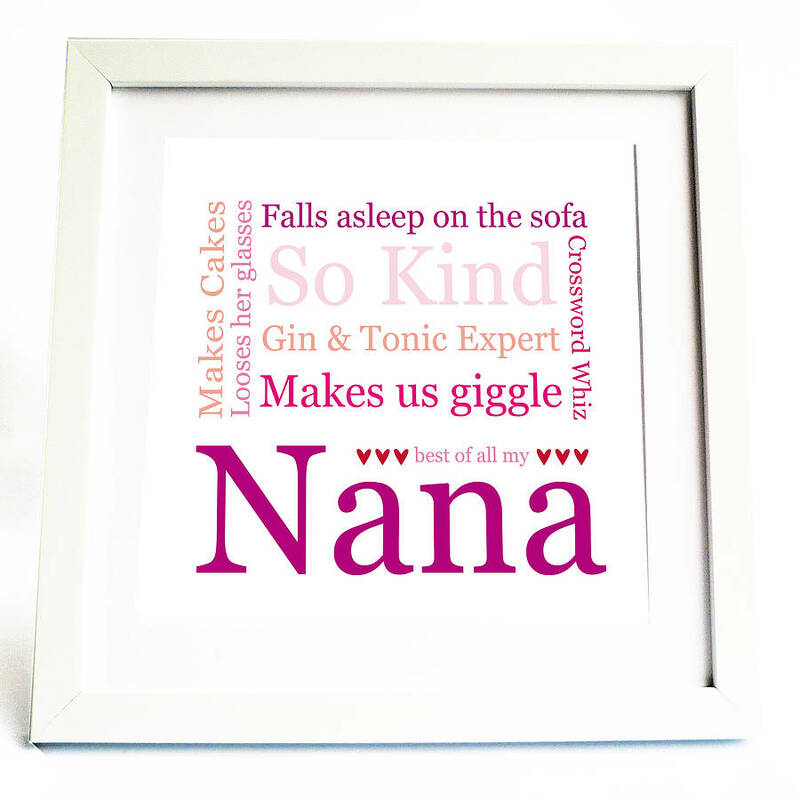 Perfect sentimental Mother's Day gift for the Mum/Grandmother who has everything. 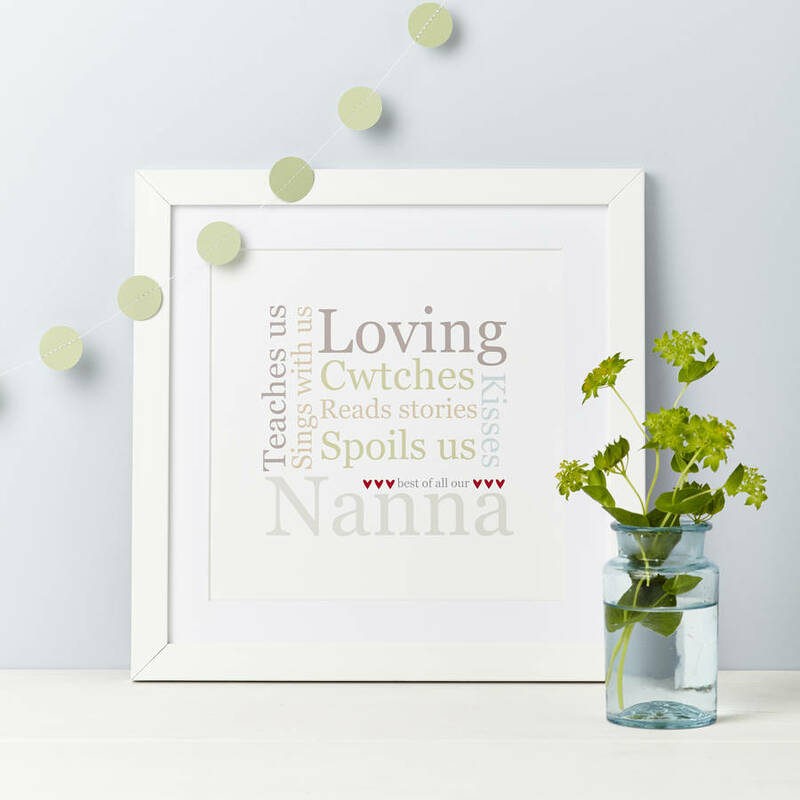 An ideal contemporary keepsake to decorate the home, would fit in any style of interior. Please note that the standard delivery dates given are only estimates and whilst we always try to ensure they reach you by this date they are not guarenteed. Option 1: A lovely mounted personalised print. 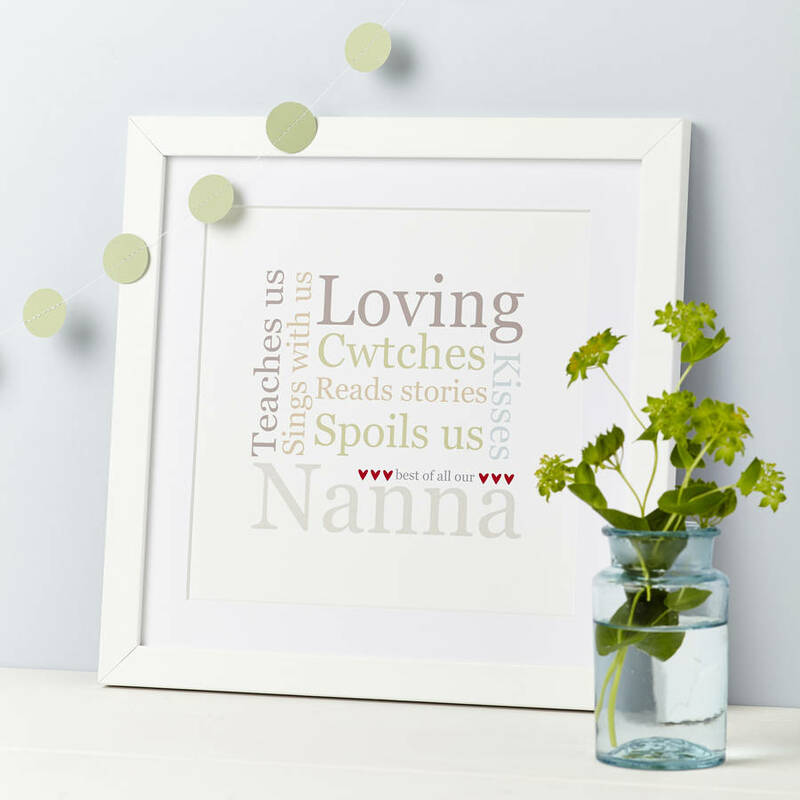 An original gift for a mother or grandmother. Printed in shades of pink. 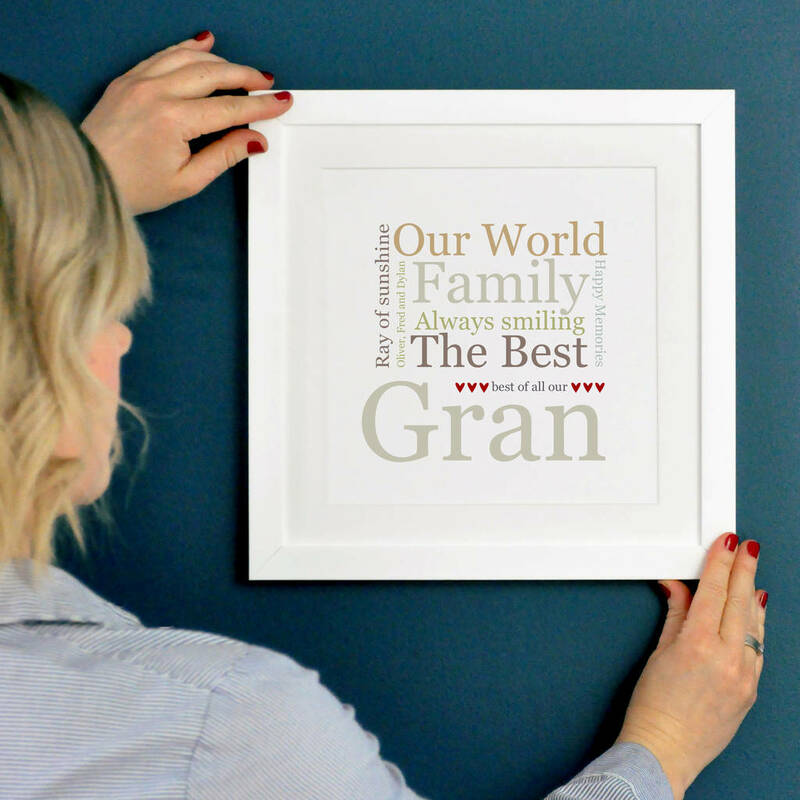 You can provide your own choice of words to add to the design making your gift totally original. The 'best of all my/our Gran/Nana' will remain the same but all other titles can be amended. Please provide all the details required in the boxes provided. There is the option to choose either best of all my Gran/Nana, if from an individual, or our Gran/Nana if from a number of siblings. 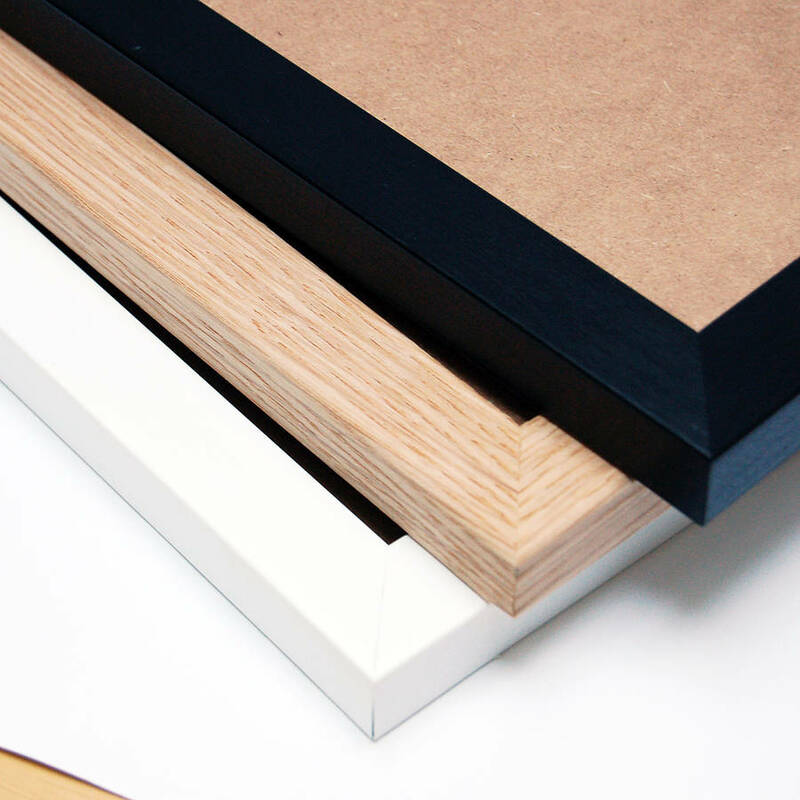 The print is supplied mounted in a thick white square mount board with backing board and presented cellophane wrapped and sealed with a logo sticker. You provide your own details to the design making your gift totally original. Please provide all the details required in the boxes provided. Please note this version is a mounted but unframed print. For our framed version please see below. Size of Mounted Print 25cm x 25cm. Supplied in a sturdy board envelope. Option 2: The mounted print is supplied in a contemporary matt white square, glass fronted frame (made in yorkshire, uk) to match any style of interior. All other details remain as per the mounted version. Size of Framed Print 27cm x 27cm. Supplied bubble wrapped in a sturdy box. We use high calibre dye based photographic inks, premium quality white 350gsm print board and snow white coloured mount board.